Christy Lee Oil Platform Fender Repair - Global Diving & Salvage, Inc. In March of 2012, the north fender on the Christy Lee oil platform, owned and operated by Hilcorp, experienced mechanical failure which caused it to plunge into approximately 80 feet of water in the Cook Inlet, Alaska. The fender structure mechanically raised and lowered with the tide to keep visiting tankers properly fended during calls. The timeline for a prompt solution was critical, as delaying the arrival of tankers to the Christy Lee would subsequently result in substantial monetary loss. Global used sonar equipment to determine the exact location of the damaged fender and its orientation on the sea floor. Crews concluded there was sufficient water depth above the fender to allow vessels to continue to call at the berth, but a temporary system would need to be devised in order to keep the platform operational. Global developed a plan to install a temporary fender, which consisted of assembling a Flexi-float barge system that would encompass both of the north legs of the oil platform and span the gap left by the missing fender. It was evaluated by our internal engineering staff and was verified by a third-party engineering firm. Global successfully mobilized, fabricated, and installed the temporary fender system in just over two weeks, three days before the arrival of the platform’s next scheduled tanker. In July, Global remobilized to the oil platform to recover the sunken fender. Constructed by a steel framework with a timber face and concrete counterweights, the fender is trapezoidal in shape and measures approximately 96 feet long, 30 feet wide and 8 feet tall, and weigh 175 tons. Divers rigged the fender for removal, taking advantage of the short slack tide intervals between 3.5 knot flood and ebb currents. 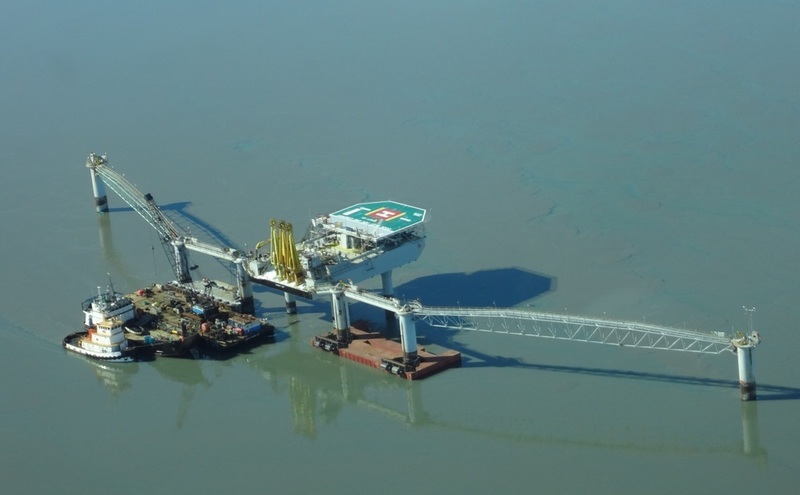 Global subcontracted Pacific Pile & Marine to provide a 500 ton crane, mounted on the barge Salvation. 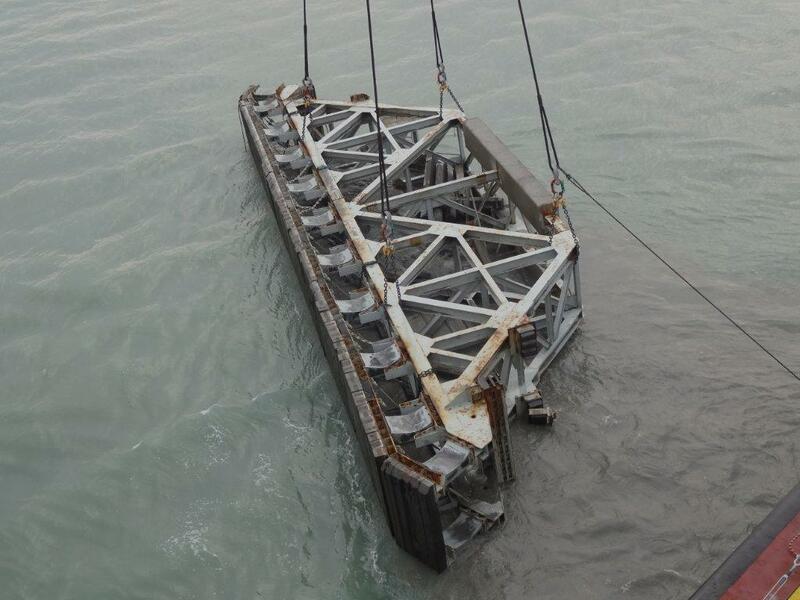 The 175 ton fender was lifted from the seafloor and loaded onto the deck barge Mr. Ed. It was then transported to the ASRC dock in Nikiski, AK where it was offloaded onto the pier, flipped over, and set down for repairs. Upon completion of repairs, the fender was transported back to the site for reinstallation. Once onsite, the Salvation lifted the fender and set it into a ‘stored’ position on the oil platform, allowing the temporary fender system to be dismantled and removed. The repaired fender, already secured to the platform, was then lowered into its permanent place and the concrete counterweights reattached. The repaired system was fully operational within seven months. “Not an easy feat for a project team to consistently rise and meet numerous challenges over many months. A remarkable project executed remarkably well by remarkable people across the board,” said Bo York, Hilcorp Facilities Engineering Manager.